This past December, I attended the Centenary Celebrations for B.K.S. 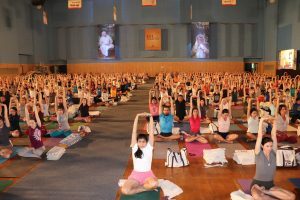 Iyengar in Pune, India. Although I’ve taken more than 7 trips to India, this was my first time to the Iyengar Institute, the heart of Iyengar Yoga. 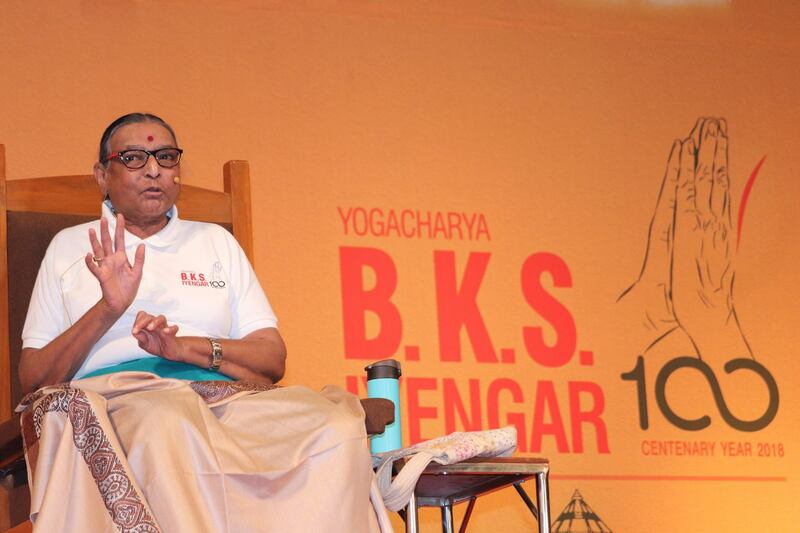 It was an amazing gathering of 1,300 people representing 56 different countries showing the diverse populations that were there to mark the 100th anniversary of Yogacharya B.K.S. Iyengars birth. I’ve studied Iyengar Yoga since the early 1990s, and B.K.S. Iyengar and his lineage have inspired me since the beginning of my practice. 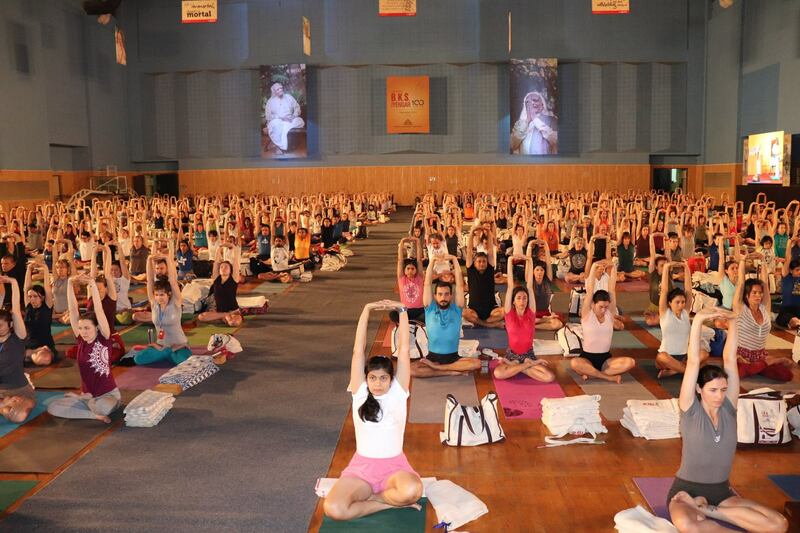 All of my teachers have been trained by, or spent significant time with the Iyengar Family in Pune, India. Born 7 December 1944, Geeta was Guruji’s eldest daughter, and she committed her life to the practice and teaching of Yoga. She is credited with advancing yoga for Womens health. Remember that yoga was originally created by men for men living in ashrams, and women were not allowed to practice. Without her work, we would not have yoga sequences and yogic knowledge of women’s issues including pregnancy, menopause and breast cancer. Geeta taught what were to be her last classes at the Centenary, and I was one of the few students to witness the brilliance of her presence and light. She taught us fiercely with a rigorous schedule for 5 days. spiritual guidance. She had promised she would teach for her Father’s 100th birthday on December 14, but nothing more. She kept her promise despite failing health. She passed away peacefully in the early morning of 16 December in her home. Here is a link to a memoriam from The Hindustan Newspaper on this Light of Yoga. It is said that on the spiritual path, when a yogi has reached a level of awareness, they can choose their time, date and place of death. Death has no power because there is the necessary awareness within to leave consciously. That final moment of transcending the limitations of the physical body happens only once, and it’s the last action of our life. 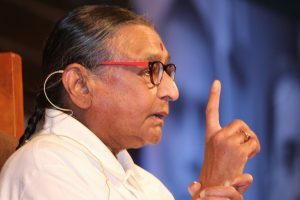 The time spent with Geetaji in Pune ignited my practice, and my commitment to teaching. Her fierce gaze spotted me in the first class, and her words have stayed with me in the weeks since, urging me on. I left India humbled and grateful for the generosity of the Iyengar family, and for Geeta and all of my teachers who have lit the path for me to walk. Deepest gratitude to Geetaji for taking us to the edge of our self imposed limitations. If we live life with grace, it is good to die with grace. May we all grow to the level of awareness where we can understand how the spirit and the physical body are connected, and that the moment of passing can also occur with awareness. There is no death for those who really understand this reality. All it takes for a road to become a path is the voyage of the traveller.